Rev. Dr. Godwin Ude is the Pastor of Transformation Christian Centre (TCC). He is also a pharmacist, certified psychotherapist,Christian counsellor and an author. He is an active member of Evangelical Order of Certified Pastoral Counsellor (E.O.C.P.C), Canadian Association for Spiritual Care (CASC) and an ordained minister with International Ministerial Fellowship (IMF).For so many years, he and his wife have worked extensively among the youth as both pastors and counsellors. They have mentored and still mentor so many young people all over the world through their unique insight into what lurks in the hearts of so many people and how to turn those to their advantage rather than otherwise. They have also worked as church planters, marriage and relationship educators and mentors to many couples and families.He holds two doctoral degrees in Practical Theology and Biblical Studies and a PhD from Oxford Graduate School. He is the President and C.E.O.of Kingdom Acts Foundation. He is also the Western district pastoral representative for the Pentecostal Holiness Church of Canada. A much sought-after speaker, Dr. Godwin teaches the word of God with great passion and revelations and he moves in the prophetic. God has used him mightily to release great men and women to their destiny, many of whom now are in full time ministry. He has authored so many published articles and books amongst which are :”Pathway to success”, “Principles of Supernatural breakthrough”, “Life lesson from my father”, “The other woman”, “Becoming extraordinary” and “The Love Myth”. Dr. Godwin and his wife Dr. Blessing have three children. Pastor Blessing is a Family Life Educator, teacher and an author. For many years she has worked alongside her husband as a church planter, counselor, marriage and relationship therapist and mentor to many couples, single ladies, youths and families. Her passion to see families thrive and not just survive compelled her to pursue and complete an M.Litt degree in Family Life Education, from Oxford Graduate School. She is also a Certified Marriage Counselor (CMC) with the Evangelical Order of Certified Pastoral Counselors of America. She holds a Masters Degree in Religious Studies from Nations University as well as a Doctorate degree in Biblical Counselling . 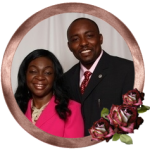 As the wife of Dr. Godwin Ude, she serves as the co-pastor of TCC. She is the Executive Director of the Transformation Christian Centre (TCC) Women’s ministry as well as the founder of the “Empowered Women’s Network”, a ministry dedicated to bridging the gap between the older and younger generation by empowering and challenging women to mentor other women and help them be the best God called them to be. She has authored so many published articles and books; one of which is “Empowered To Mentor”, “The Empowered Woman” and soon to be published “The Empowered Wife”.She is very passionate about families and believes her primary role as a woman is to be a great helpmeet to her husband and a loving mother to her children. PST. HEZEKIAH AMUKOA on Our Ultimate Inheritance in Him.